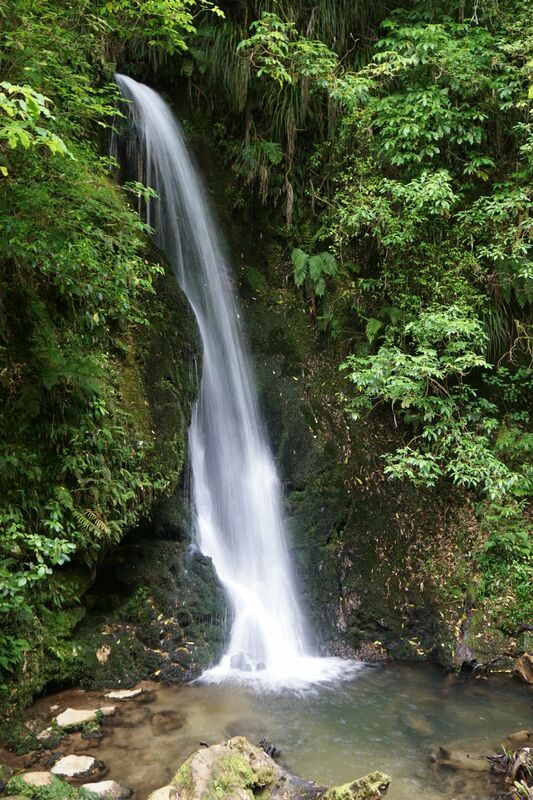 McLaren Falls Park is accessible from McLaren Falls Road, which branches off State Highway 29 about 19 km south-west of Tauranga. 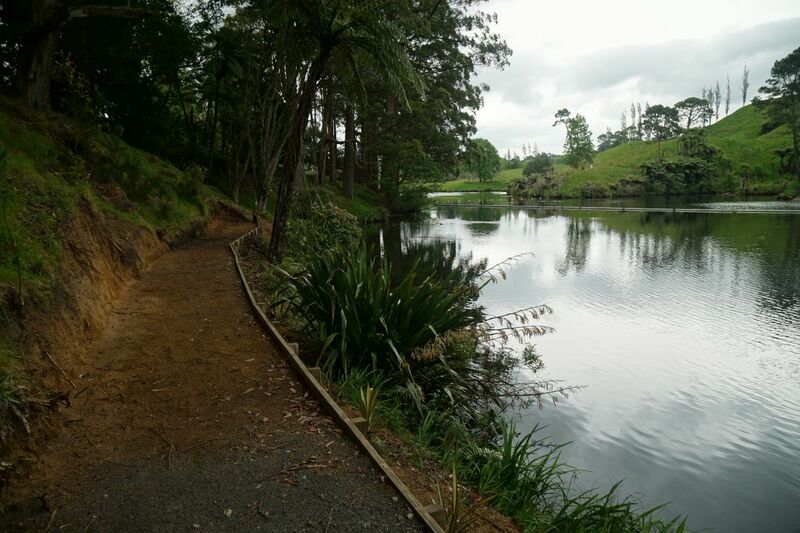 There are numerous walking tracks within the boundaries of the park, with most of them providing easy walks on well-formed and wide tracks. 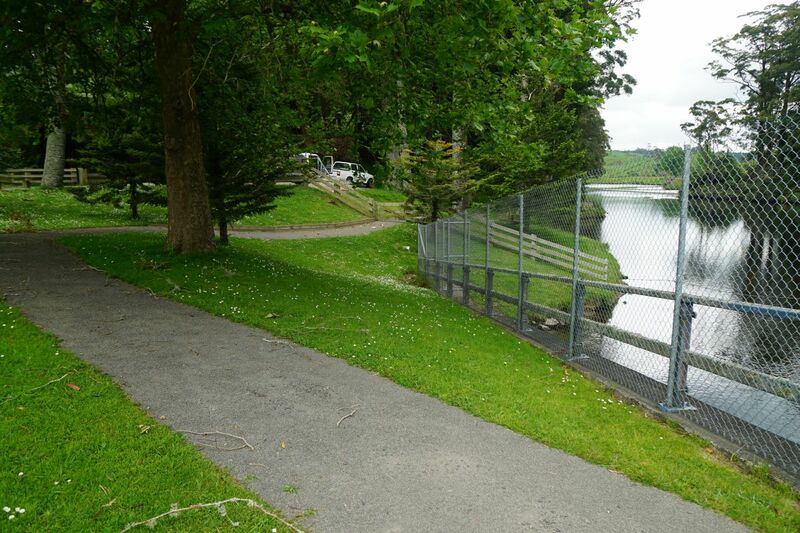 The Lakeside Walkway runs almost the full length of the eastern side of Lake McLaren, from the road entry off McLaren Falls Road almost to the access road to the Lower Mangapapa power station. 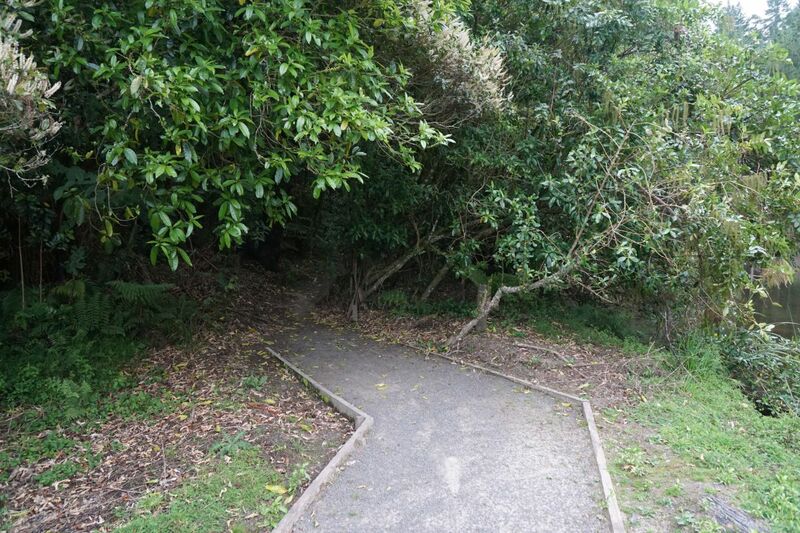 The Waterfall Track branches off the Lakeside Walkway, crosses over the road and then loops alongside a stream on the way to and from the small waterfall. The Lakeside Walkway is about 2.3 km long, including the steeper and rougher section near the power station access road. 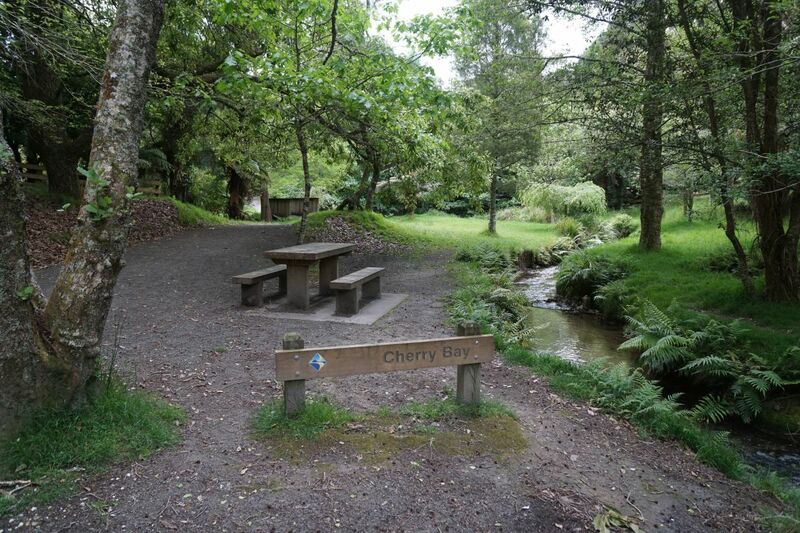 The distance from the Lakeside Walkway at Cherry Bay to the waterfall and back, using both branches of the loop, is about 1.3 km. Toilets are accessible from several locations along the tracks, as shown on the maps. 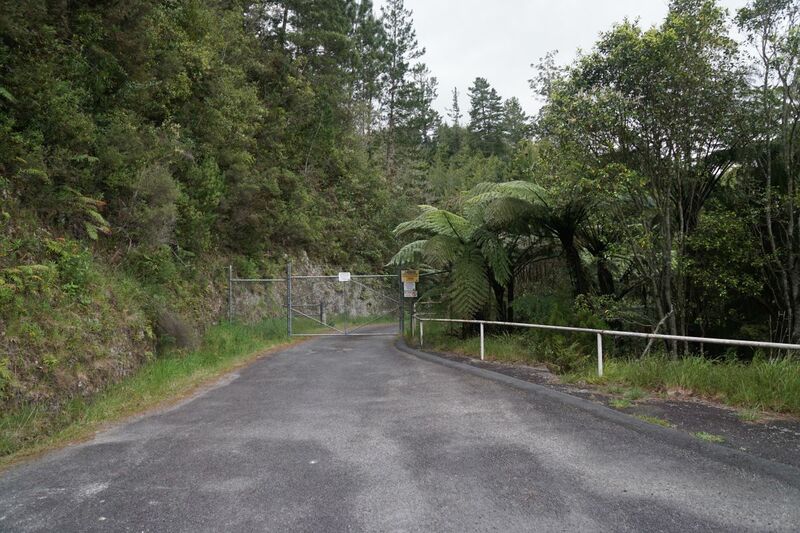 Parking is available on both sides of McLaren Falls Road near the park entrance, and at several locations within the park. 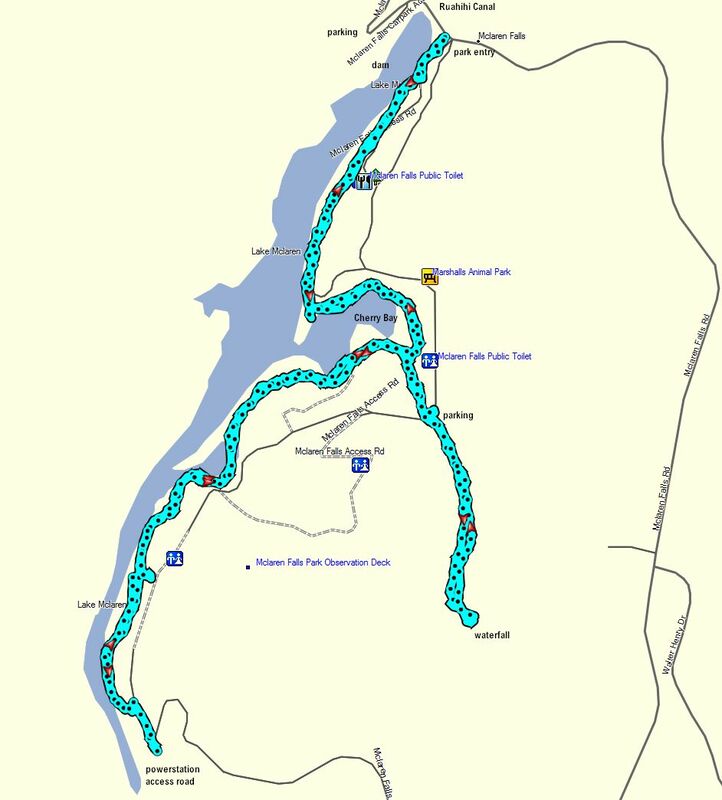 Some information about the tracks and a map is available on the Tauranga City Council web site. 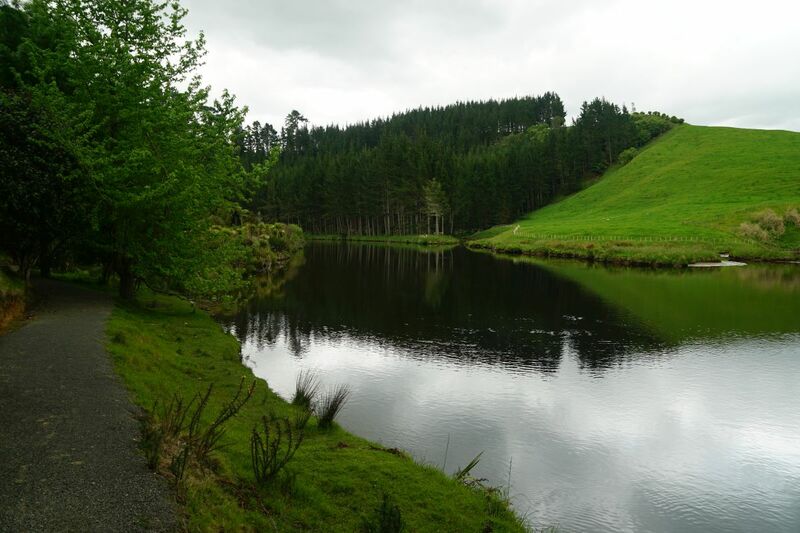 See also the post “McLaren Falls Park – Rimu Track” for maps of the park and the tracks, including a topographic map. On this map the tracks are not named, but are shown as dotted lines. 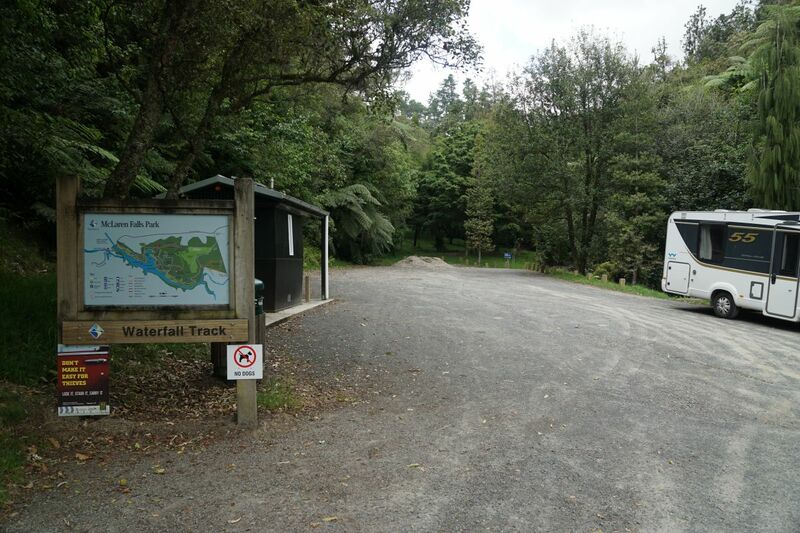 In one location, near the information centre, the track uses one of the park access roads. The start of the Lakeside Walkway by McLaren Falls Road. 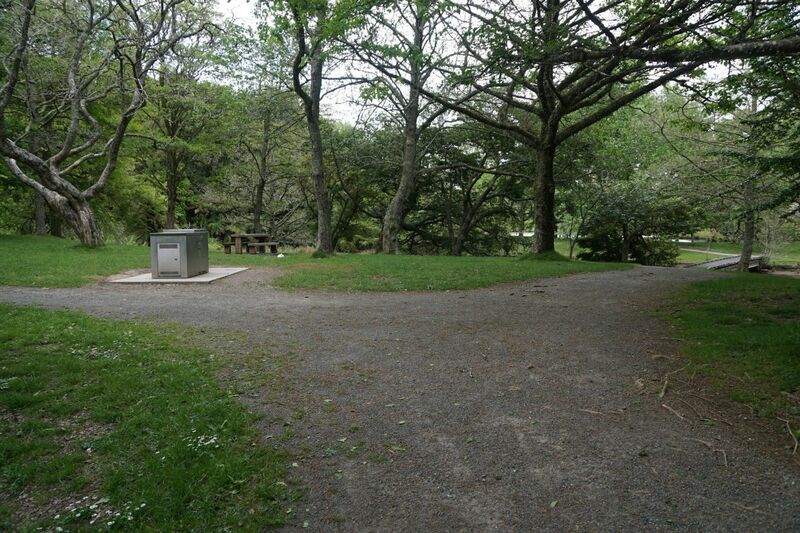 The vehicle entrance to the park is by the wooden fence to the far left. The first part of the track is wide and well formed. Here looking back towards the entrance and McLaren Falls Road. Currently a short section of the track near the entrance is being built, with the well-formed track ending abruptly with a rough bypass to the track continuation. 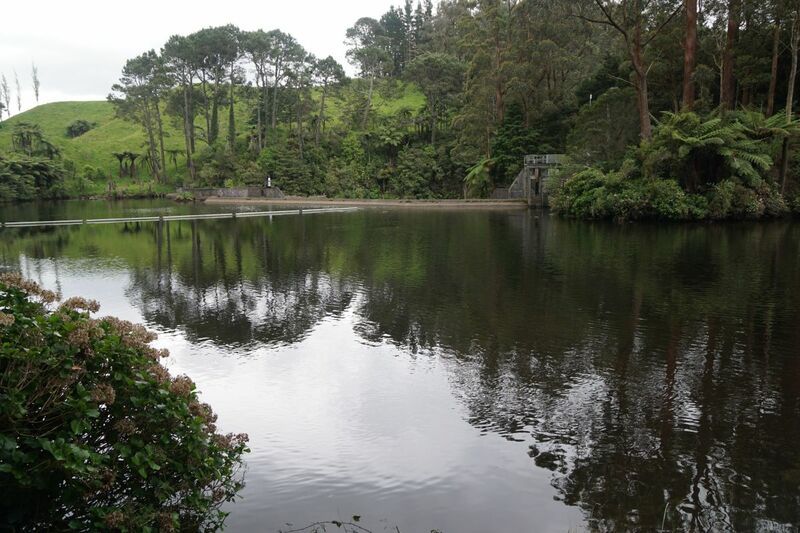 Looking across Lake McLaren to the dam above the McLaren Falls. 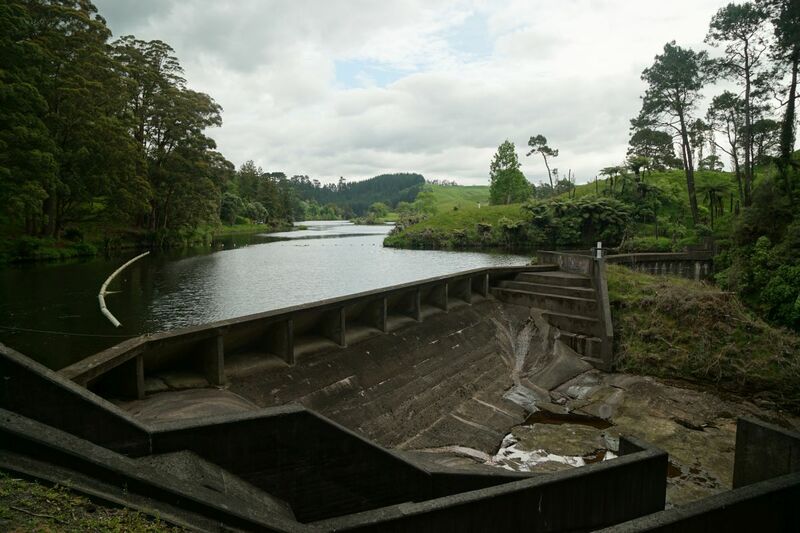 The flow of water in the Wairoa River is controlled from this dam. The short length of track shared with the road ends by a ramp where kayaks can be launched. 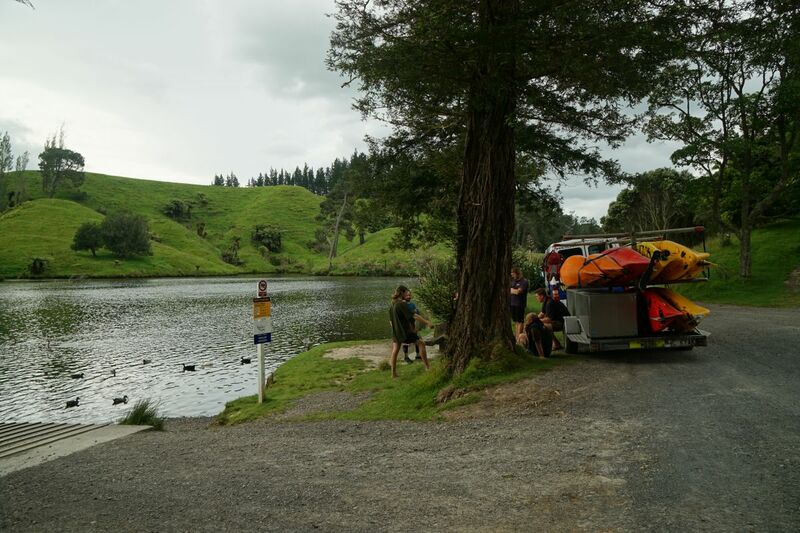 On the return walk a group of kayakers was being instructed before venturing out onto the lake. Looking at Cherry Bay from a small lookout with a bench seat at the north-western entry to the bay. At Cherry Bay the Lakeside Walkway continues on to the right. The track to the left is the start of the Waterfall Track. 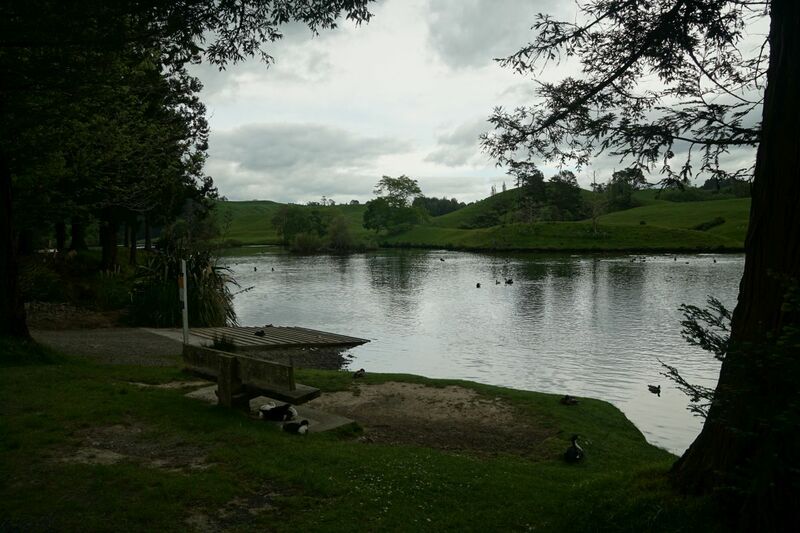 The lake has a variety of aquatic birds, including ducks, shelducks, swans, geese and pukeko. 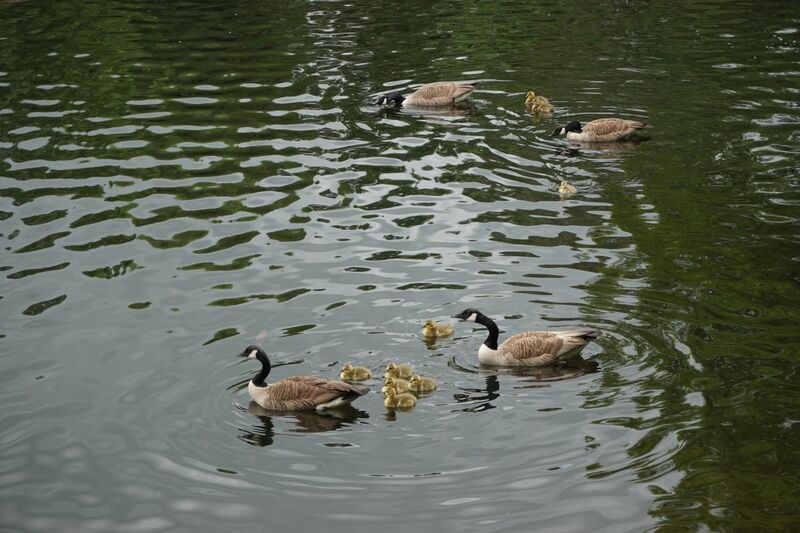 Here two families of Paradise shelduck with their young. 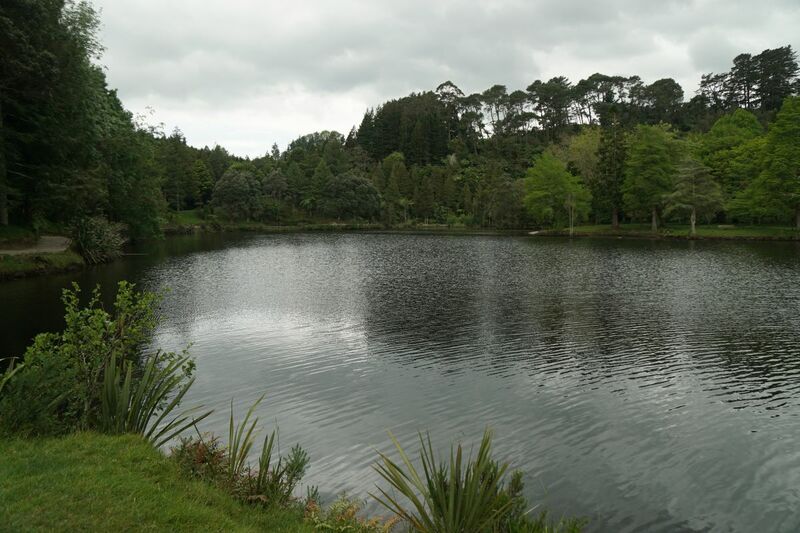 Looking across Lake McLaren near an open grass area with vehicle access. For most of the way the Lakeside Walkway runs parallel to the road through the park. Approaching the top end of the lake, with a pine forest on the opposite side. Across from the pine forest the wide, well formed track ends, and a narrow track with numerous steps passes through an area with small trees, zig-zagging up the hillside to the road near the power station access road. 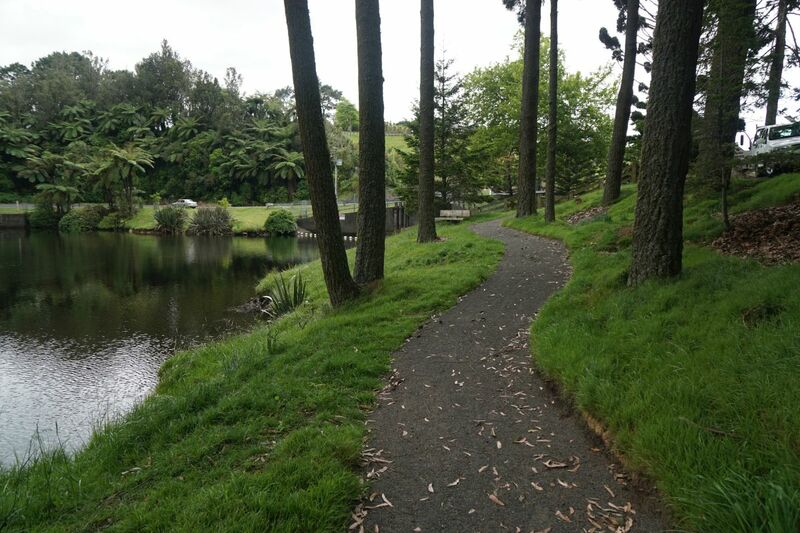 The Lakeside Walkway exits to the right of the ponga fern left of centre, on the other side of the road, by a small parking area. The power station access road is now closed to all entry. It is no longer possible to walk to the power station. On the return walk along the Lakeside Walkway the Waterfall Track route was taken. 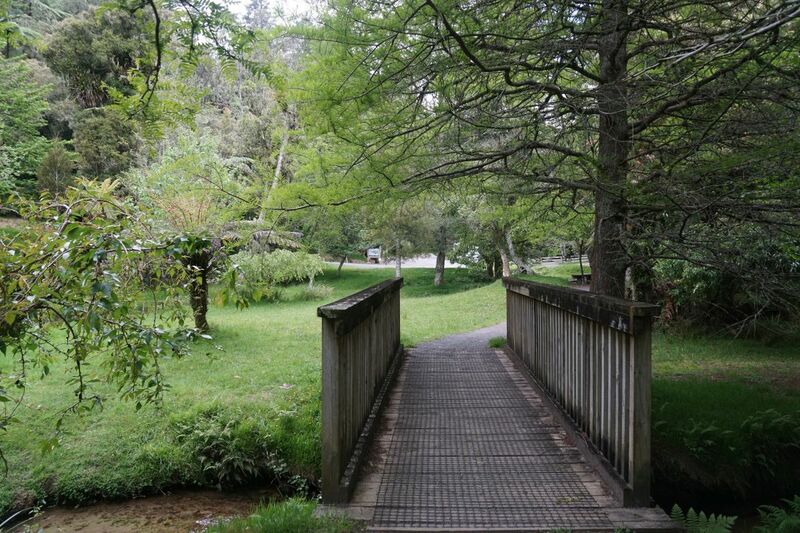 A small bridge crosses a stream between the Lakeside Walkway and the road crossing. Looking back to the small bridge. 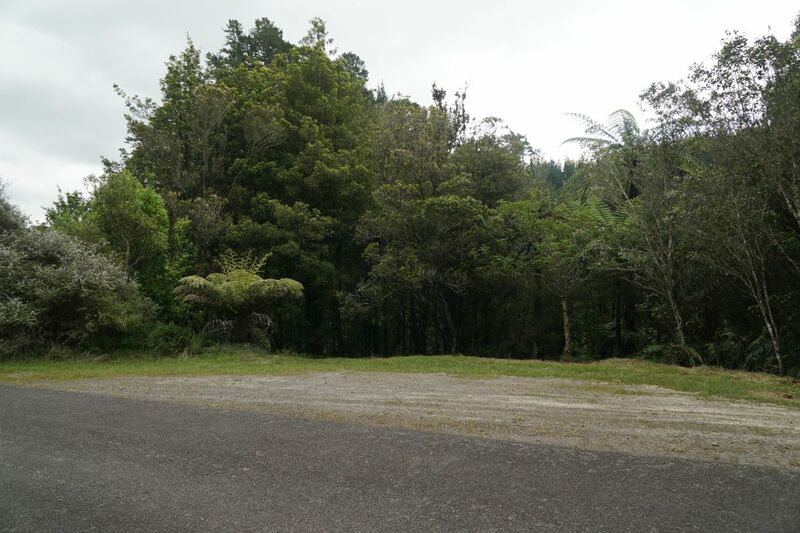 The parking area, map of the park, and toilet by the start of the Waterfall Track. A small bridge behind the campervan crosses over the waterfall stream, giving access to the steeper track with steps to the waterfall. The track on the parking area side of the stream has no steps. Along the steeper waterfall track glowworms can be seen after dark. 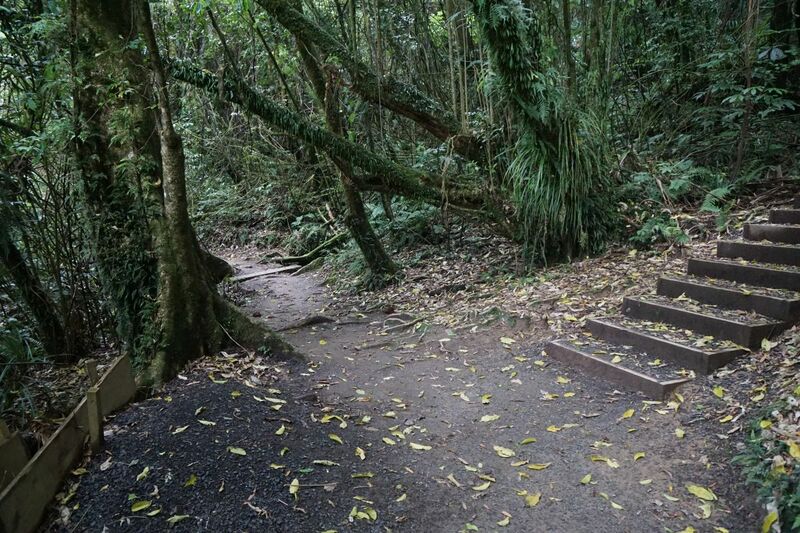 A side track, called the Nikau Track, branches off this track near the waterfall. The waterfall seen from a small lookout platform. 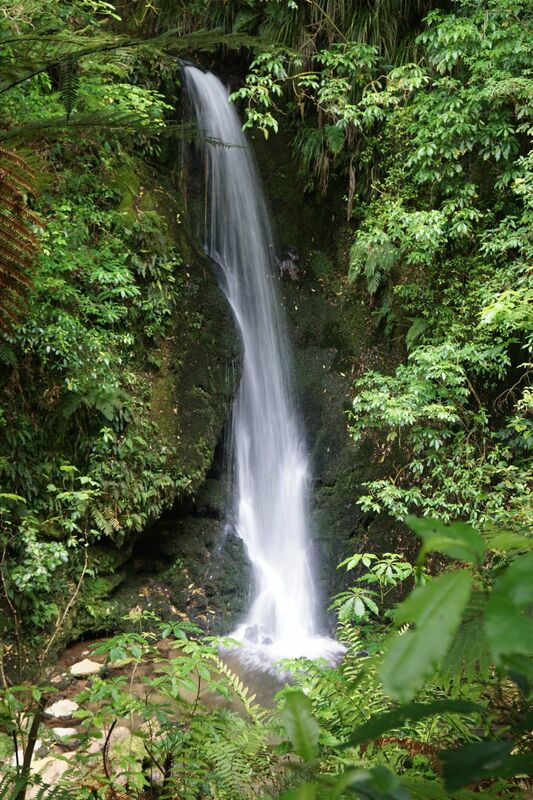 And from the steps leading to the easier waterfall track. On the easier Waterfall Track branch a bridge crosses over the stream near the waterfall. The steps at picture centre lead up to the viewing platform and the steeper track. 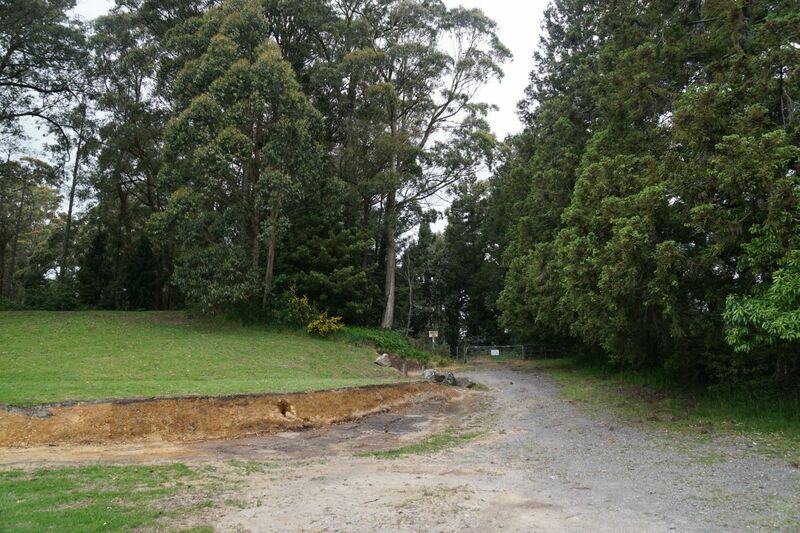 A short track leads directly from the sharp hairpin bend on McLaren Falls Road to the dam just above McLaren Falls. The dam as seen from the opposite side of the lake from the Lakeside Walkway. 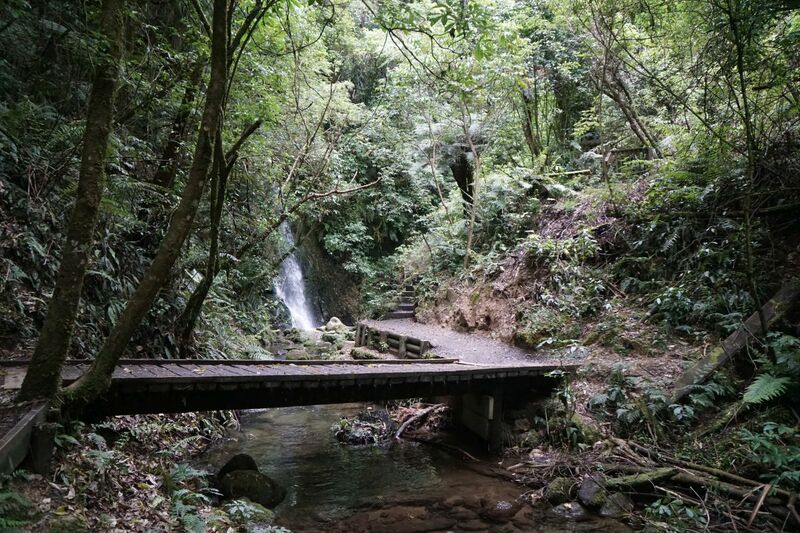 McLaren Falls Rd to Cherry Bay/Waterfall Track start: 1 km, 16 minutes. McLaren Falls Rd to power station access road: 2.3 km, 35 minutes. Waterfall Track from Lakeside Walkway, both ways: 1.3 km, 20 minutes. Total almost 6 km and 90 minutes. 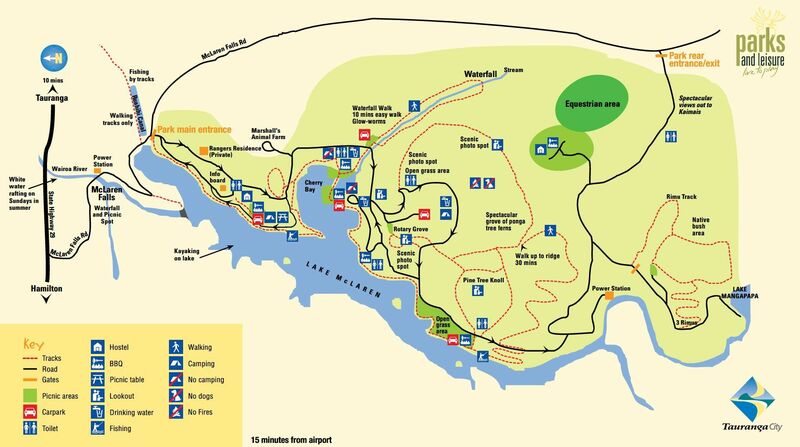 This does not include the short walk to the parking area and the dam. 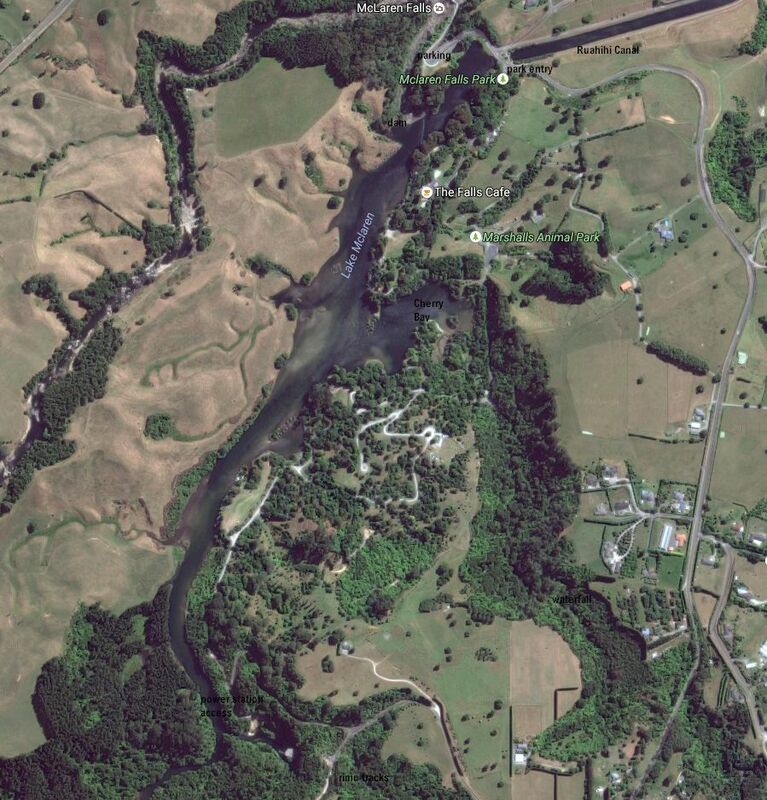 The aerial image, from Google Maps, shows about the same area of McLaren Falls Park as the GPS tracklog, and also some of the places of interest. The tracks were walked on November 10, 2016. 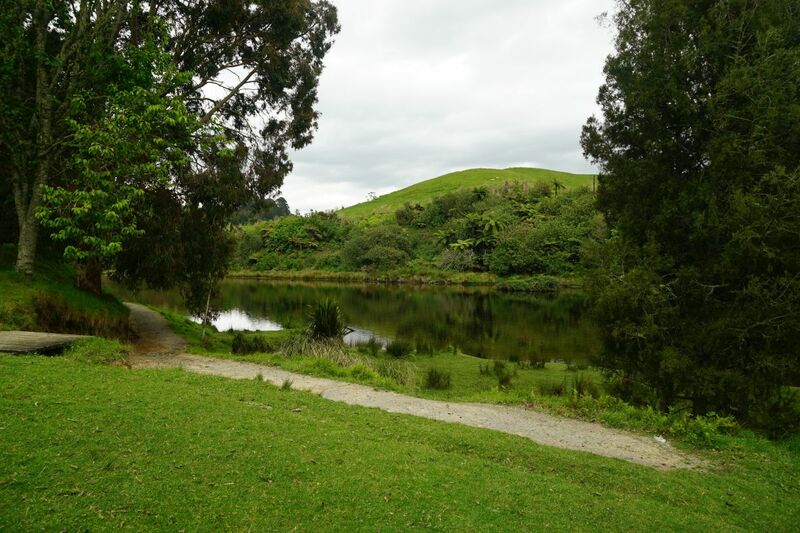 This entry was posted in Walks and tagged Lake McLaren, McLaren Falls Park, Tauranga on 2016-11-10 by nzartig.